My, it's been quite some time since I've had a post here at TNYW. Rest assured I'm alive and well, just resting. Anyway, hopefully you've looked at the Teaching Dates tab to see that I have indeed scheduled workshops for 2017 at the Preservation Resource Center. 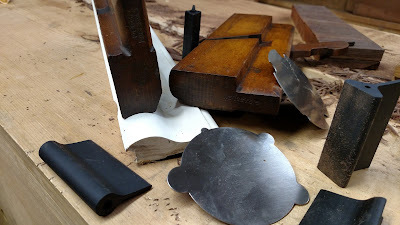 Coming up Thursday evening of next week, the 16th @ 6:30pm, is Multiple Moulding Making Methods which will demonstrate several methods of making short pieces of moulding for replacements. Some of the tools we'll use are above. I'm working on PRC workshops for the fall, as we are taking the summer off this year. If there's something you'd like to see or something that was held previously that you missed please comment and let us know. Soon I'll have some announcements about other events where you can catch a presentation. Stay tuned! Yep, another date change. 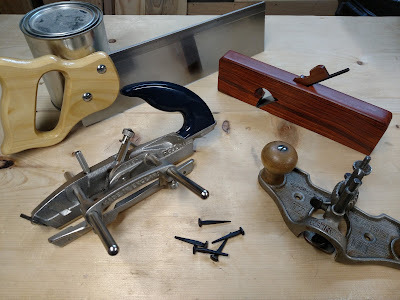 Anyway, Mortise, Tenon and Dovetail will be this Saturday Nov 12 at 10am at the Landmarks Preservation Resource Center. Ever want to cut your own dovetail joint? Here's your chance. Looking forward to seeing everyone there.